It took a long time, but our pets are finally being fed like we would the rest of our family members: with fresh, all natural ingredients from the fridge. However, it wasn't always this way. For nearly 70 years, food options for dogs and cats remained largely unchanged: dry, extruded kibble or canned wet food. But in 2006, with a simple idea that all pups and kitties deserve fresh, all natural and nutritious food, that all changed. [caption id="attachment_93260" align="aligncenter" width="680"] A Brief History of Pet Food in the United States[/caption] Years before "pet food" was sold, pets ate what we ate. Back in the late 1800's and early 1900's, without much knowledge of proper pet nutrition, our dogs and cats ate either what was readily available, like table scraps, or what was cheap. When Purina and many others introduced dry dog food in the 1950's, the cooking process may have changed, but pets still lacked the proper nutrition and fresh ingredients the needed to thrive. The extrusion process used to make this kibble involved such high cooking temperatures that essential nutrients, like amino acids, were often lost in the process. Fast forward 70 years and kibble is made much the same way. While the introduction of premium and natural kibble has been a step in the right direction, the production process still involves overcooking ingredients to make our pet's food shelf-stable for years. 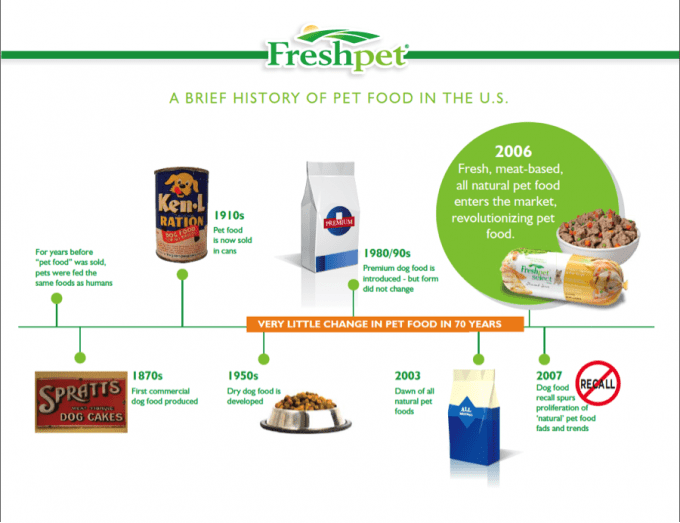 So, in 2006, we decided to take a whole new look at pet food. Knowing that we felt better eating fresher, healthier foods, we asked ourselves: "Wouldn't our pets, too?" Because we see our pets as family, we believed they deserved to eat like family too. That's why we began cooking Freshpet recipes using fresh ingredients, while gently-cooking our batches instead of rendering them. This helped us to lock in the essential nutrients our pets need. Finally, because our recipes were made from fresh, all natural ingredients, they needed to be refrigerated, just like the food we eat every day. [caption id="attachment_93263" align="aligncenter" width="408"] There are now over 10,000 Freshpet fridges throughout the US and Canada! [/caption] It's pretty hard to believe how little change there was in our pet's food for so long. But since the introduction of Freshpet, more and more pet parents are heading to their local Freshpet fridge for your pet's food, like your pup's favorite Freshpet Select Slice and Serve roll, or your kitty's favorite Vital Complete Meals. No longer is shelf-stable kibble or canned wet food the only option for your pet. Today, your loved ones can eat fresh, all natural and refrigerated food, just like the rest of the family does. Now that's what we call pet food evolution.